Stem cell therapy may be the treatment of the future, but there's little evidence available to suggest it's the miracle drug of the present. BROOMFIELD, Colo. — Stem cell therapy may be the treatment of the future, but there's little evidence available to suggest it's the miracle drug of the present. 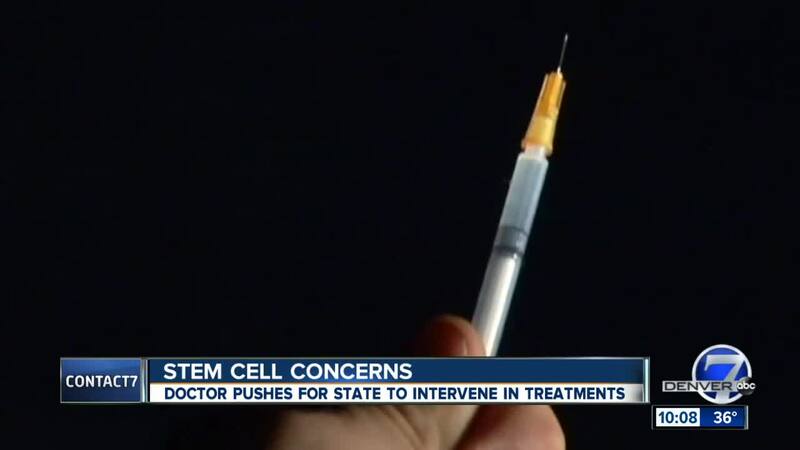 A local doctor and researcher wants state lawmakers to intervene and protect Coloradans from wasting thousands of dollars, per injection, on unregulated and unproven stem cell therapies. Chris Centeno of the Centeno-Schultz Clinic, who's specialized in regenerative medicine and research for more than a decade, said too many people are simply being scammed. "It's really out of control," he said in an interview with Contact7. He's speaking of the stem cell products that have flooded the Colorado market in the last 18 months. They're heavily advertised online, on television and in print. They're often derived from amniotic donor tissues and frequently marketed to people with chronic pain over free dinners in hotel ballrooms or restaurants. "Who here thinks 30-plus years is too long for pain?" a presenter is heard saying at a stem cell event Contact7 attended in an undercover capacity last spring. The presenter was working for a licensed chiropractor -- not a medical doctor -- in Denver. She claimed the office is using third-party stem cell products to treat not only orthopedic issues, but also diabetes, COPD, erectile dysfunction and Alzheimer's disease. "It's the wild, wild west," Centeno said. He acknowledged that the types of stem cells sold could potentially provide short-term anti-inflammatory benefits, but advised that real doctors offer more proven types of anti-inflammatory remedies at a fraction of the cost. For instance, platelet-rich plasma (PRP) injections, using a concentrated mixture of a patient's own blood, have proven effective in certain cases. He pointed to FDA rules that show the types of stem cell products being sold, derived from another human being's tissues, are legally required to be dead. Thus, he said the products are incapable -- and scientifically unproven -- to regenerate tissue as they're often advertised. The FDA has not approved the use of stem cells, derived from tissue donors, to treat common ailments. As Contact7 learned in more than one undercover stem cell seminar, the injections are typically sold for roughly $3,500 per injection at a minimum and are not covered by insurance. "I welcome good competition -- physicians who become knowledgeable in this area, trying to do good work," Centeno said. "What I don't welcome is the bait-and-switch scams. And it's actually my concern that those bait-and-switch scams are going to destroy the entire industry even for physicians who are trying to do good work." Centeno urges Colorado lawmakers to adopt legislation that was introduced, but died, in Florida last year. It would have cracked down on non-physicians running for-profit stem cell clinics by essentially requiring them to register with the state and abide by a host of rules that would help prevent patients from buying into misleading medical claims. At least one Colorado legislator is looking into the proposed legislation. "It needs to be done yesterday. We have consumers who are getting scammed, losing their life savings, on a day-to-day basis," Centeno said.